Pinnacle Bank Arena will offer premium seating for businesses or individuals wishing to enhance their game or event experience. Premium seating packages the best views with upscale features, amenities and service. Whether spending an evening with family and friends, entertaining business clients or rewarding employees; premium seating creates a memorable event experience. Three levels of premium seating will be available in Pinnacle Bank Arena - Suites, Loge Boxes and Club Seats. For suite rental information click the link below to download a form. Suites are located on the private premium level approximately 23 rows from the arena floor. Upscale furnishing, superb sightlines and personal service make each Pinnacle Bank Arena event memorable. 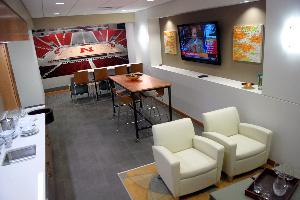 Professionally decorated, fully furnished and adorned with upscale features, including a wet bar, food and beverage counter, center island, refrigerator, drink rail with bar stools and flat screen television, the Pinnacle Bank Arena suites provide suite holders and guests with every comfort imaginable. Suites include tickets to all arena events, convenient parking adjacent to the arena, a private entrance, and access to the club lounge and private restrooms.